prior to going to st Kitts, I thought I wouldn't like it. there wasn't much that appealed to me in terms of tours. we decided to take a taxi to the beach and hope for the best, worst case scenario go back to the ship early. boy was I wrong! !! took a taxi to south friars beach, I believe we paid $8/pp. our driver stopped along the way for us to take pictures and explained about the island. rented 2 chairs and umbrella at Carambola for $22. it was gorgeous! nice beach and beautiful scenery. some limited snorkeling right off the beach near the pier as well. the bar in the resort was a bit slow as it got busier toward lunch, but that's a minor issue. so glad i was wrong about st. kitts, and I can't wait to go back!! I LOVE this island. However, saying that, I haven’t seen much of it. We go to Friars Bay, a place called Carambola Beach Club. It is the closest beach to the port. The cab fare is $6.00 per person one way. When you get to the club, you can purchase a chair for $10.00 and an umbrella if you want one for another $10.00. We opted for no umbrella, but purchased two chairs. (Totally worth it) If you get there early enough, you will get to pick your location before the place fills up, because it will fill up!! I got a 45 minute massage on the beach for $35.00... (It was awesome) and of course, Edward the Monkey made his appearance so I could get in some of my beloved monkey photos. This day was hot, hot, hot, and I got the most sunburned on this beach. There is a separate area for snorkeling if you want, my friend video taped two sea turtles. There were a lot of fish just swimming in the water close to the shore, which seemed to freak some people out, but they were small. St Kitts is beautiful. As soon as you get off the ship, there are monkeys everywhere. They are so cute. We did an excursion with the St Kitts Scenic Railway. Got amazing views of the entire island. They handed out free drinks (the rum punch was the best), and had singers come to each section of the train to sing. For St Kitts, we did the Catamaran sailing to Nevis excursion. 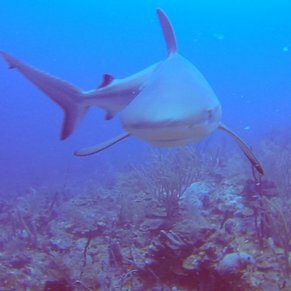 For me, this was the best excursion I've been on during a cruise. 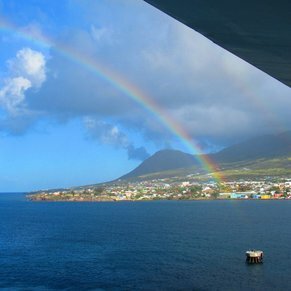 This excursion featured a leisurely catamaran sailing to Nevis. It included an open, unlimited bar with water, soft drinks, beers, and rum punches, and then right before we landed on the beach, there was a grilled lunch served. The Catamaran crew were excellent and provided great service. The beach itself was nice, though for me not the star of this excursion. The sail back was a whole lot of fun. They put up all the sails and we were clipping along pretty good. It was a very exciting ride back. Highly recommend this excursion to others! 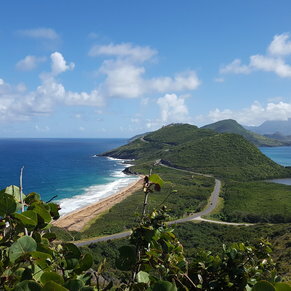 3 of 16 shore excursions in Basseterre, St. Kitts. 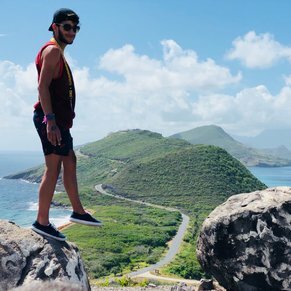 There are currently 4 discussions about Basseterre, St. Kitts.